Biggymans Clothing has the largest range of t-shirts for men to 15XL. View the full range of t-shirts by clicking on your size. Are you looking for a specific article? Then we recommend that you first contact the customer service. View our new collection plus sizes men's fashion. In addition to the popular Kitaro Polos is also our range from North 56, Maxfort, Duke, Culture and Casa Moda Polos. View the full range of plus sizes men's Polo shirts by clicking on your size. Are you looking for plus sizes men's shorts or swimwear then you have come to the right place, our sizes range from 2XL to 14XL. You will find a very wide range of shorts and swimwear in various colors. At Biggymanskleding we have different brands plus sizes men's jackets for each season to 14XL. View the range by clicking on your size. If you have any questions about finding the right size please contact us! XL mens clothing free delivery! Why Biggymanskleding better than other shops / stores? ✔ We are the cheapest large size men's shop / store in the Benelux. ✔ With us you pay always the lowest price, we also provide a price guarantee on our clothes. ✔ Our large size men's store is located in the center of the country, Almere port. ✔ We deliver within 24 hours! ✔ From € 75, - you pay no postage costs us, our competitors are much higher. ✔ We have the largest collection in large sizes, anywhere you find such a large selection! ✔ We offer many payment options such as: AfterPay, ideal, kredit card, paypal, transfer beforehand. 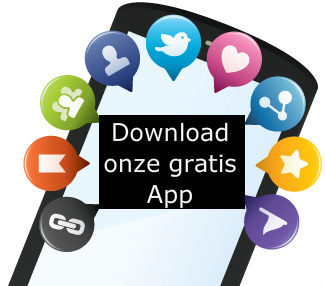 ✔ You can pay to us afterwards with Afterpay or Billink. ✔ What other promise and not fulfill we do, with us you can ask anything and we also come after. ✔ Service is our top priority, we will always neatly solve problems with you. ✔ Questions are answered within 2 hours via facebook chat. So for the best prices, inventory and service you need to be with us !!! 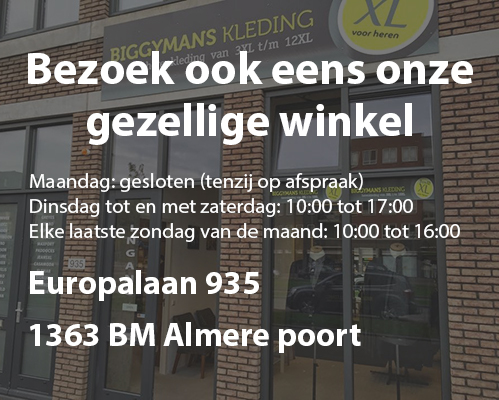 Biggymans Fashion in Almere has long been specialized in supplying large sizes in the Netherlands, Belgium and Germany. Our range of large sizes, men can be considered affordable, sporty and fashionable. We have a wide range of men's clothing in large sizes, such as T-shirts, polos, (nail) trousers, jackets and more. Take a look around the website for our complete and versatile range of large size men. Currently Biggymans Dress even the cheapest provider of outsize menswear in the Benelux. So are you looking for outsize fashions from size 2XL to 14XL, then you are at the right place at Biggymans Clothing. Our collection outsize menswear will be updated several times a year. Wherefore our website sharp eye to keep abreast of the latest updates in menswear, or subscribe to our newsletter. You are welcome in our large size men's store in Almere, but online ordering via the web shop is also possible. If you order before 15 pm, you have the item, if available, the next day at home. Faster is almost impossible. Shipping costs only € 4.95, and € 75 this already prepaid! Customer service is our large size men's store paramount. If you have questions about our outsize menswear, delivery or any other topic, please feel free to contact us and we will give you a look appropriate response within 24 hours. We carry the following brands for our collection of big sizes: Replika, Aero, North 56, D555, Kamro, Kitaro, GCM Sports, Arrivee, Culture, Honeymoon, Redpoint, Pioneer, Paddocks, Casa Moda, Fellows United, Seven Seas, Brigg, Maxfort, by Friedrich Klotz, Skopes, Duke, AllSize, Haupt, Dario Beltran, Maple, Marvelis, Jupiter, Canson. Our sizes range from 2XL, 3XL, 4XL, 5XL, 6XL, 7XL, 8XL, 9XL, 10XL, 12XL and 14XL. Biggymanskleding specializes in outsize menswear.